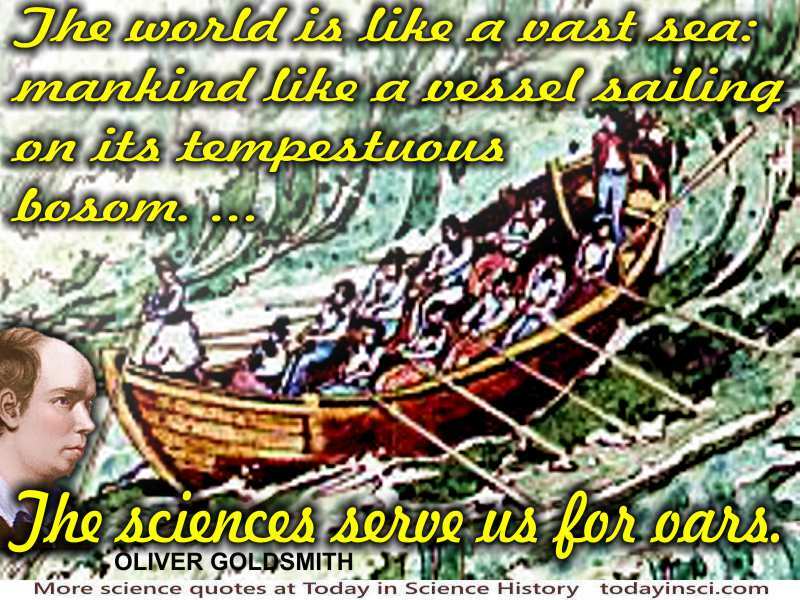 Oliver Goldsmith - Sciences Serve Us For Oars. — Oliver Goldsmithfrom a Chinese Philosopher', LXXXIII. After receiving a B.A. degree in Dublin (Feb 1749), Oliver Goldsmith began, but exhausted his funding before completing study at the medical school in Edinburgh. Instead he ended up London, working at various jobs, including an apothecary's assistant. From 1759, he found he had a marketable skill in writing, and became an essayist published in various journals. A series of his Chinese Letters essays were collected and published in book form as Citizen of the World (1762). In these, he satirized Western society in the commentary and philosophy of a ficticious Chinese visitor to London. Science Quotes by Oliver Goldsmith.